There is the Hemlock Society which is devoted to suicide and The Eulenspiegel Society whose members gather to express sadomasochistic desires. Perhaps in the directory of forbidden societies, these two are cross linked, as suicide can be looked at as the ultimate act of self-abnegation. But what other forbidden secret societies exist? 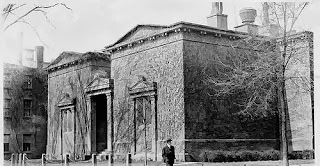 As far as the secret part goes Yale’s Skull and Bones is one of the most secret with its secrecy being the most forbidden thing about it. What goes on in its secret crypt which is the incubator for future leaders of business and government? Obviously there are other forbidden societies which collect things like intelligence. Let’s say you rise up in the NSA to a point where you have access to the most restricted information our government has to offer. Who are you going to discuss these matters with, but other members of this select group which shares your privileges? Similarly let’s say you’ve earned an astronomical amount of money. Who are you going to discuss the problems of maintaining and having such wealth with than others in this elite club whose forbidden covenant has to do with dominance and greed. Tom Wolfe termed the aspiring members of this forbidden society, the Masters of the Universe. And then there is Opus Dei, the Catholic society whose rituals, in imaginatively embellished form, have been the basis for thrillers like Dan Brown’s The Da Vinci Code. And what about terrorist cells which are so secret and forbidden that the members only know each other by their avatars? Still in all of these endeavors there’s an implicit camaraderie. Whether your out to destroy yourself or the world, you belong to a forbidden society because you believe in something that creates a special bond with those who share your unique vision of how life should or shouldn’t be.